A close up of David Louis Clemetson in 1914 from the photograph below. Lt. David Louis Clemetson (1893-1918) was one of a very small number of black officers serving in the British military during WWI. Very little information is known about Clemetson apart from his military record, but this is what research by Trinity Library and College staff has uncovered. 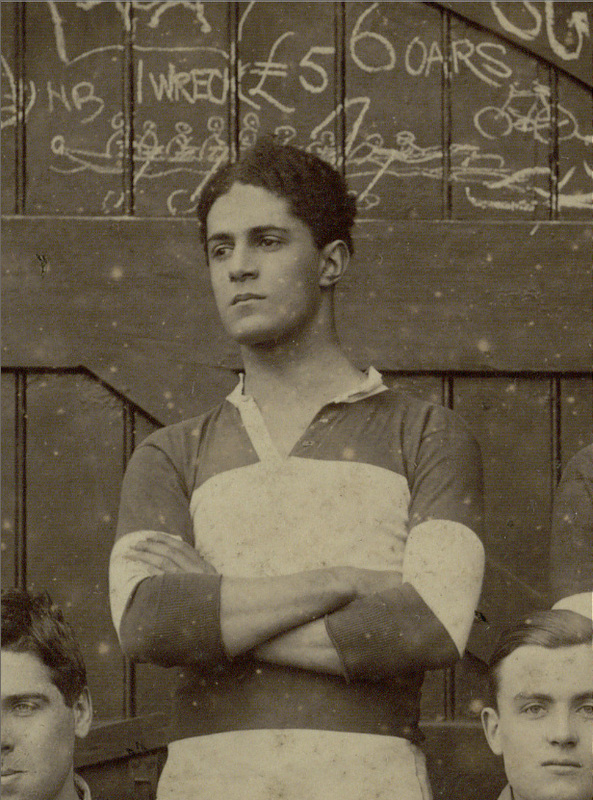 Born in St. Mary, Jamaica, Clemetson attended Clifton College in Bristol, where he served for five years in the OTC. 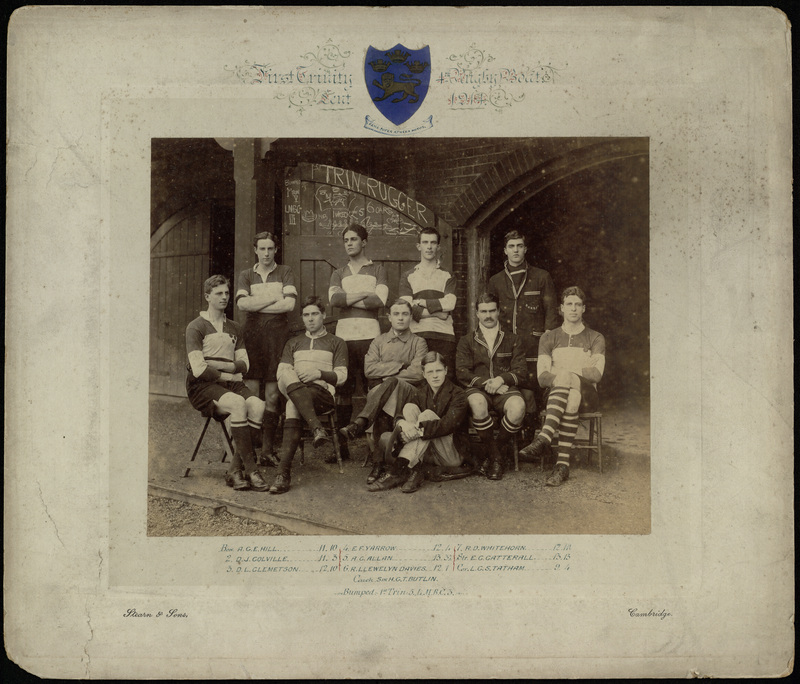 He was admitted to Trinity in 1912, studying Law and rowing in the Lent Bumps. At the outbreak of war in 1914, Clemetson seems to have left his studies to enlist in the Sportsmen’s Battalion of the Royal Fusiliers, a unit whose slogan was “Hard as nails”. He was wounded while serving with the Royal Fusiliers, invalided back to England, then transferred to the 24th Welsh Regiment of the Pembroke Yeomanry, at which point he received a commission to serve as Second Lieutenant in October of 1915. While the Allied forces were joined by hundreds of thousands of soldiers from British Dominions and Crown Colonies such as the West Indies, India, Pakistan, South Africa and Nigeria, Clemetson was one of a very small number of black officers in the British Army itself. The 1914 Manual of Military Law restricted black soldiers and those who were not citizens of Britain from command in the BEF. However, Clemetson and a handful of others gained commissions despite the barriers. These brave men rose through the ranks, fought and in some cases died fighting for Britain in the First World War and it is hoped that a century later their stories will not be forgotten. 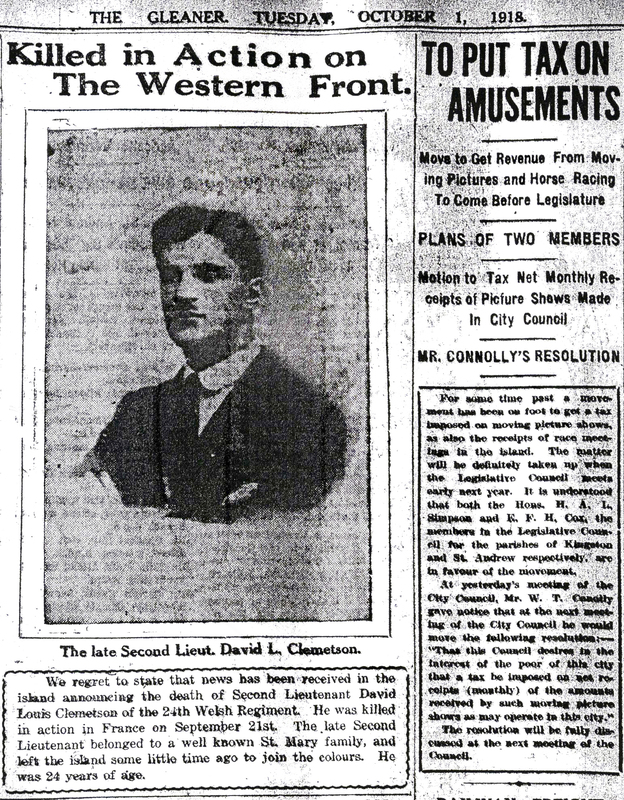 Lt. David Louis Clemetson was killed in action in Perrone, France. His name is listed on the British West Indies Regiment memorial in Port Maria, Jamaica and he is buried in Vendhuile, France. He was posthumously awarded the Victory Medal and the British War Medal. A copy of Clemetson’s obituary from 1 October, 1918. Reproduced with kind permission of The Jamaica Gleaner.